When we get to the top of a summit or pass we often joke about wanting a bat suit or hanglider for the descent. This time we had a bus! 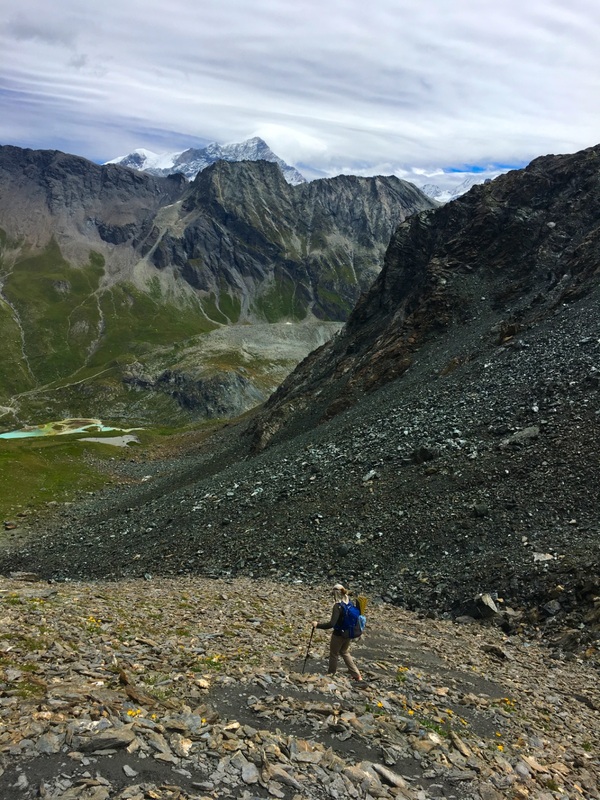 Given our time constraints, when planning our Haute Route hike we combined some shorter days making for long, but what we felt to be doable, days. Now that we are here and have experienced how unknown trail conditions like boulder fields greatly slow us down, we were a little skeptical about being able to achieve today what we had originally planned. The Haute Route is similar to off trail hiking, you go a lot slower than you would on a bonafide trail. 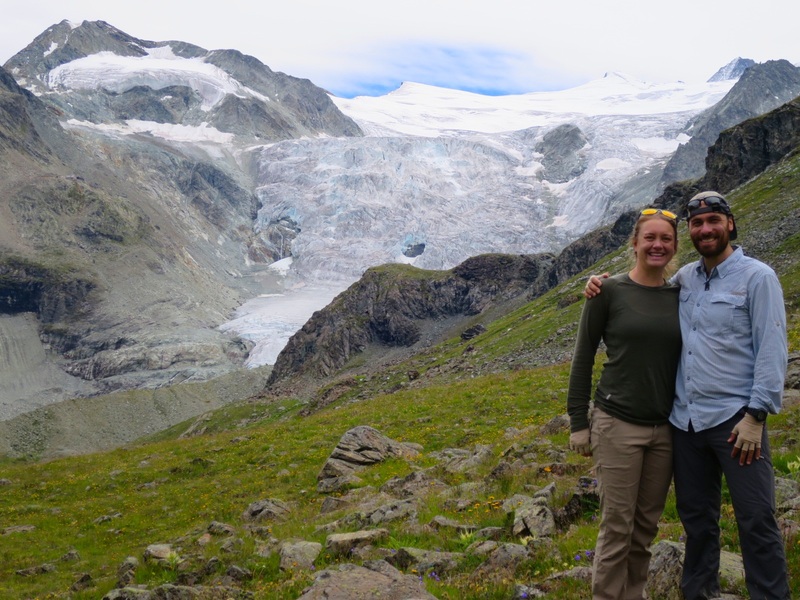 Initially we were going to hike from Arolla to La Sage and then to Cabane de Moiry. For most, this is done in 2 days but a combined 9.5 hours of total hiking seemed doable. Over the last 3 days we have been tracking our timing with that on the signs. We have consistently been 1 – 2 hours slower. Our potential 9.5 hour day would could likely be a 12 hour day depending on conditions, and with dinner at 6:30pm we didn’t think we could swing it. Although the weather was decent (cloudy wth patches of sunshine) we wanted to be able to take our time and enjoy ourselves. Particularly since this may be the only day with decent views as rain is in the forecast again starting tomorrow. So… we cheated. Actually, Laurie thinks we cheated. Andy feels we made a smart decision. 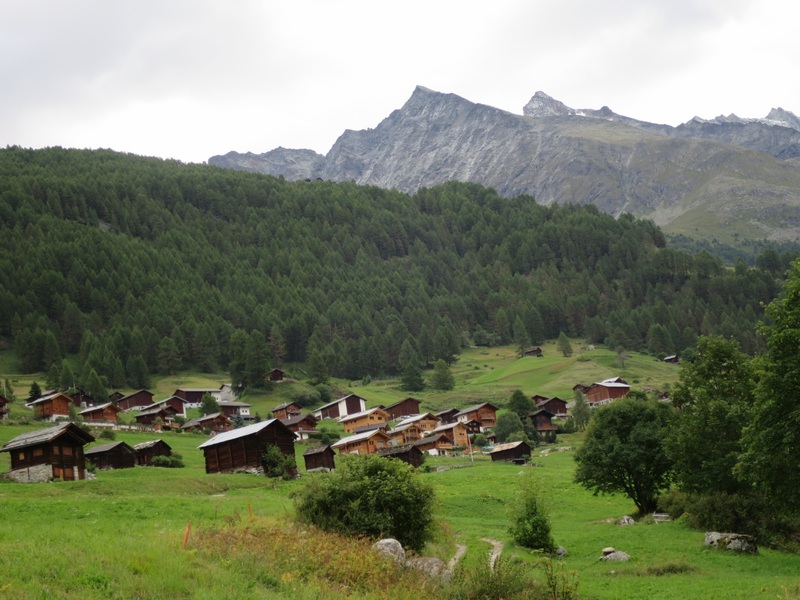 We took the bus from Arolla to Les Hauderes. This 20 minute bus ride saved us at least 2 hours of hiking. Because most of that section’s hike would have been downhill, it made the bus ride seem even more worthwhile. We were the only people on the bus and the driver recognized Andy from the day before when he had stopped the bus to clarify the pickup time and cost. He waved as he slowed the bus to let us embark. We wandered through the narrow streets of Les Hauderes following yellow blazes and signs with a hiker on them. The trail wound between wooden chalets with brightly colored flowers in flower boxes outside each window. Once near the outskirts of town the trail led us straight up the green hillside. We had been warned that the trails were steep but it always different to be told something and experience it yourself. We continued to climb up the grassy slope filled with wildflowers, next to a babbling brook. There were many cow patties but we didn’t see any cows. The trail was steep and the air quite humid but we appreciated having a dirt trail to follow. We also love to climb, which is why we went to Les Hauderes rather than La Sage. The incline leveled off a few times as we passed very small alpine villages, but soonafter it was business as usual. In the main towns many of the older structures have been remodeled but the further we got the more rustic the buildings became, many of which had stone roofs. 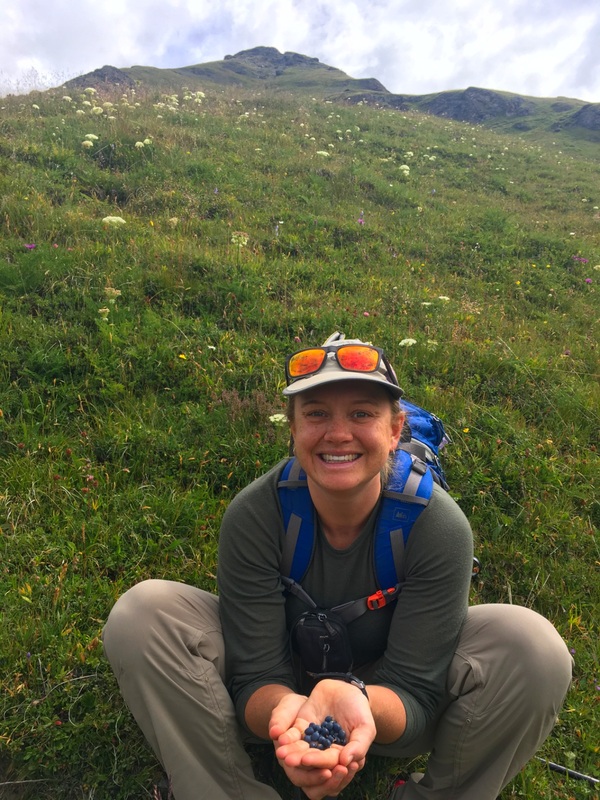 We were hiking along, huffing and puffing, both in our own heads, when all of a sudden…”Blueberries!” squealed Laurie with delight. This was a wonderful surprise for Laurie. There, along the trail were little blueberry bushes. We stopped to fill our palms and then our stomachs before continuing on. “I knew we should have brought out Talenti containers!” Laurie exclaimed to Andy. We crested the top of the first hill only to see a continuation of the grassy slopes, but this time we could see the Col in the distance. We could barely make out the outline of a signpost on the horizon, but it was there. We like seeing where we’re going and how much more effort it will involve to get there. The view behind us was breathtaking. Multiple snow capped mountains and glaciers. “Man, this never gets old” stated a grinning Andy. We stopped for a little break to enjoy the view and air out our sweaty feet. We were making good time and were in no rush. Once refreshed, we completed the remaining climb up to the Col de Tsaté. The trail was well marked and we climbed from the grass lined trail to one consisting of shale. Unlike other Cols this one had a trail leading up and over. Most Cols prior have been rocky and we followed blazes to get to them, so it was nice to hike up to a Col on a trail. In total we climbed up 4500 feet from the valley floor to the top of the Col. Some may consider this suffering but we both enjoy a good physical challenge. And the feeling of our hearts pounding in our chests never gets old. Our sweat soaked shirt and pants leaves much to be desired but it is a small price to pay. 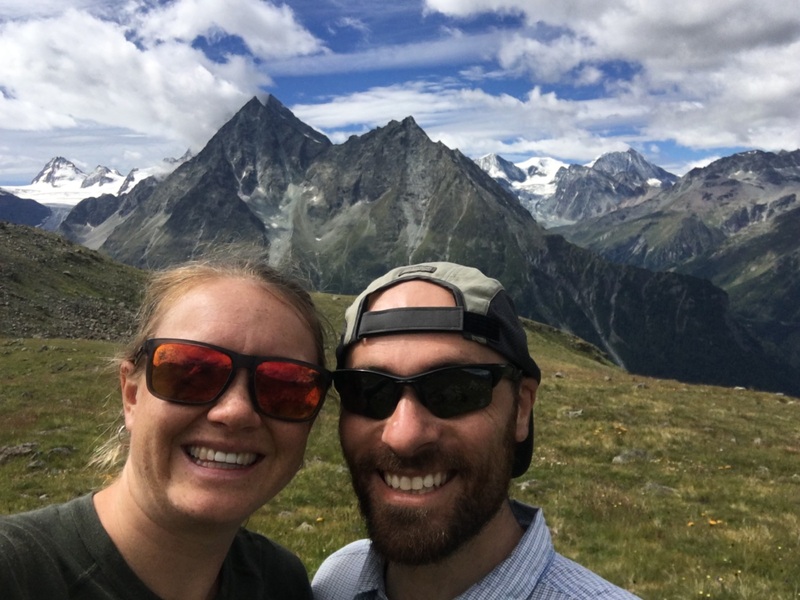 Once at the Col de Tsaté﻿ we ate an apple and took some pictures, saying goodbye to the mountains and glaciers around the valley of Arolla and excited to see what lay ahead. As we descended the views kept improving. The turquoise Lac de Moiry glistened in the sun and the Glacier de Moiry grew in stature. 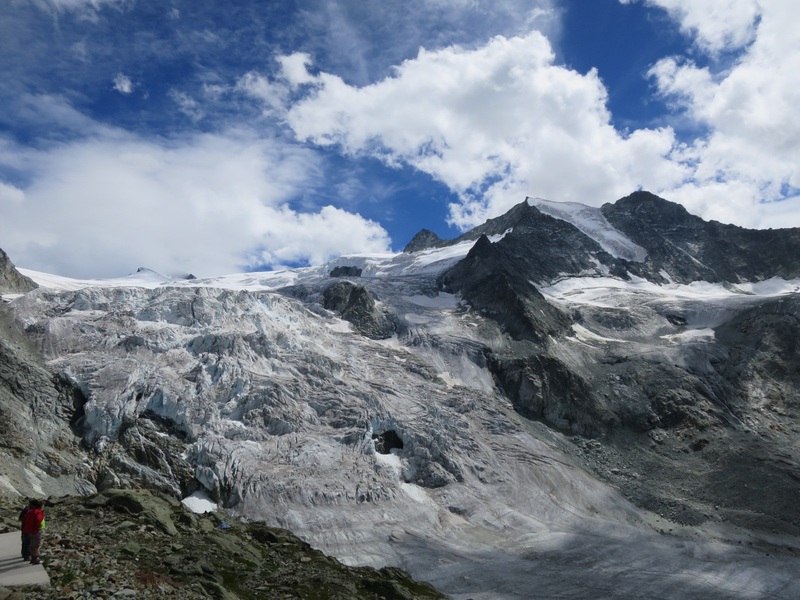 The Cabane de Moiry – our home for the night – stood prominently on a hill next to the glacier. It seemed to good to be true. Like something you’d find in a Bond movie. But there it was, waiting for us to hike up to it and enjoy its views. We wound our way back down through wildflower ladden meadows toward the lac. Here lay a parking lot and a LOT of day hikers. Once at the bottom we began our final 1500 foot ascent to the Cabane. The beginning of the climb was gradual but the last 500 feet felt like a vertical wall. This was made more challenging by the frequent stops to let descending day hikers pass. At 3:45 we finally reached the Cabane. And for Laurie this place felt very fancy. It was renovated in 2010 and still feels new. 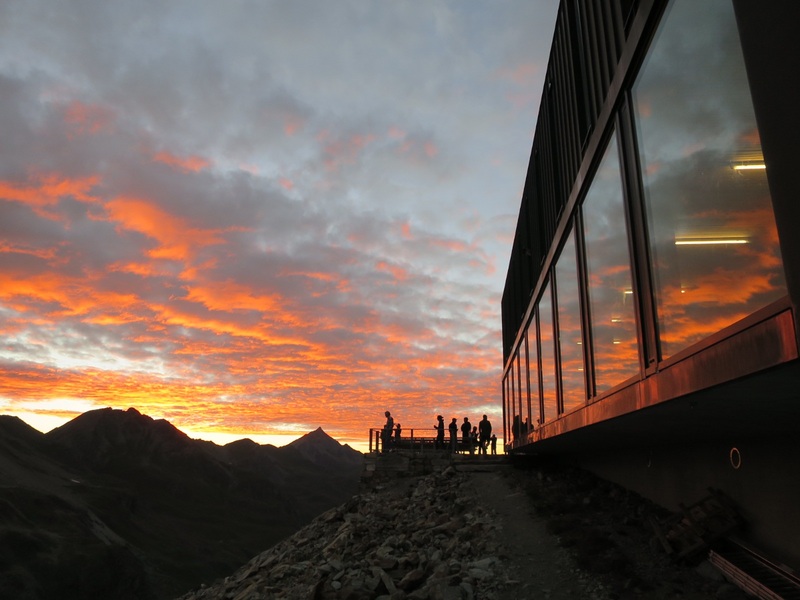 The dining hall has floor to ceiling windows overlooking the glacier. We ate a snack and took in the views. ﻿There were at least 80 people staying here tonight. 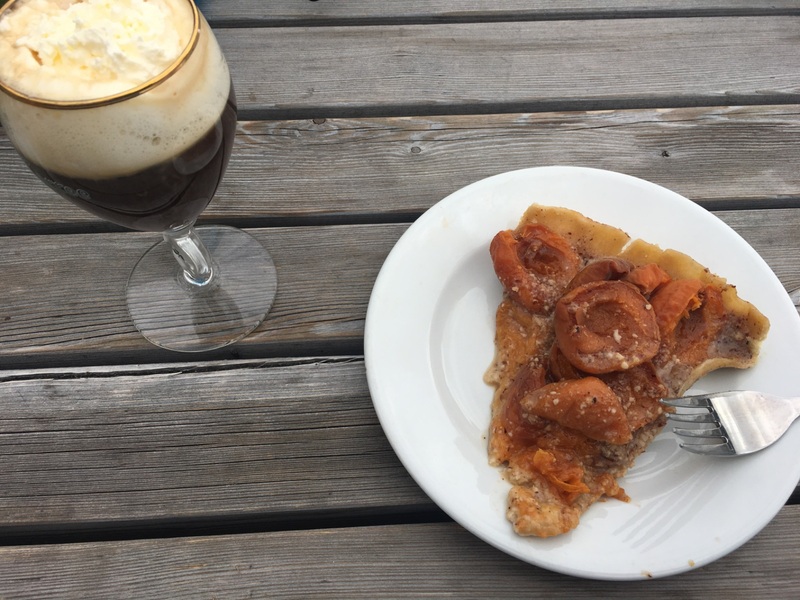 We ate another delicious 4 course meal while conversing with a couple who live outside Zurich but spent some years living in Vancouver. 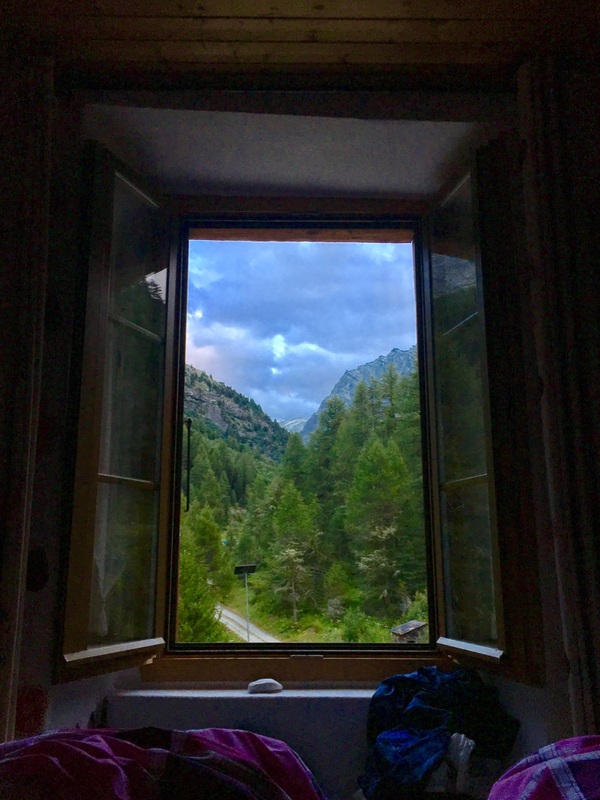 It was fun to trade travel tales and be tempted by all the wonderful outdoor opportunities in Switzerland and Europe in general. ﻿They recommended we try the more technical blue and white route to Zinal (as compared to the red and white one we had been following). This is typically the mountaineers route but there was no snow so crampons and ice axes were not needed. 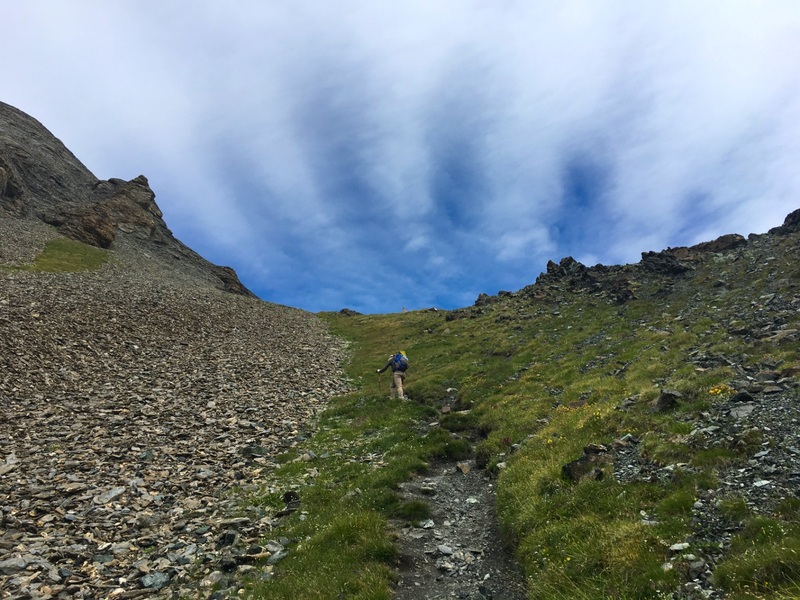 We were tempted by the added adventure but once we admitted to having trail runners- Markus- the husband, changed his mind saying it may not be safe. He was right. The loose shale on the descent would have been quite the challenge, especially since Andy’s shoes have over 500 miles on them. Next time! We watched an amazing sunset before settling into our dorm beds around 9:30. 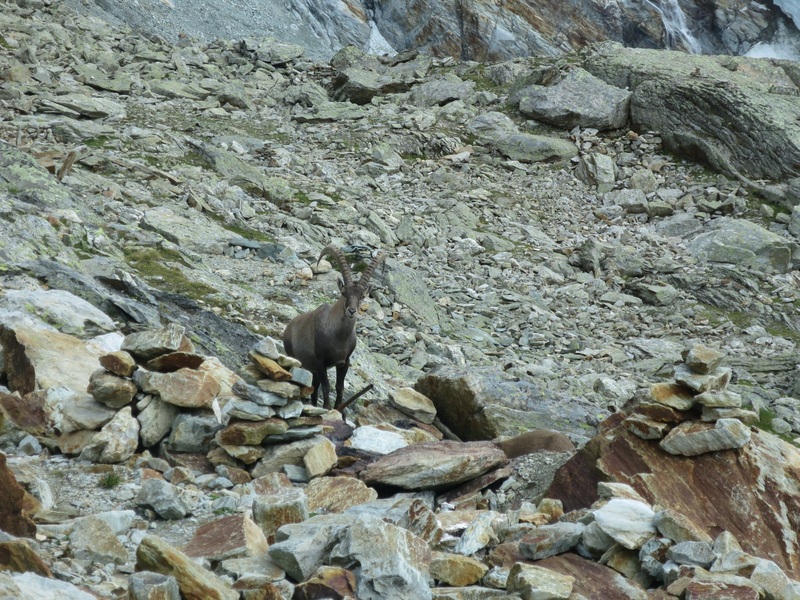 But right before the glaciers lit up in a golden color, an ibex came to visit. It was 10 feet away from us, just grazing without a care in the world. Today was another beautiful day and we will try to get some sleep before an even longer day tomorrow. Our alarms are set for 5:10am for our longest day yet! Tonight we are grateful for surprise blueberries and seriously cool cabanes. 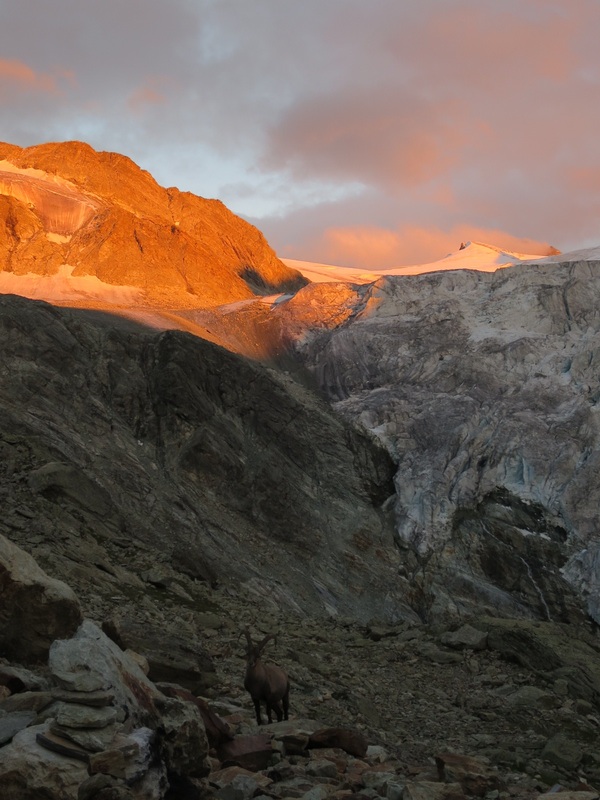 Now you can say you REALLY know what “Alpenglow” means: you’ve seen the real thing! the pictures are breathtaking….love to you both on your amazing journey. Thanks. Everyday is amazing. I wish I could live here!